St. Mary’s College of Maryland was one of the first colleges profiled at Educated Quest. Considered Maryland’s “Public Honors College,” it was named for the first capital of the state. It is also the highest rated public National Liberal Arts College in US News rankings, and has gotten mentions in editions of the Colleges That Change Lives. But this school can also be too easily confused with Mount St. Mary’s University, a Catholic school 150 miles northwest near the former Mason-Dixon Line. Since the college had a prominent label as a public honors college—only Florida has a truly similar school (New College of Florida)—and was a realistic half-day’s drive from home in Central New Jersey, I did a visit in the spring of 2011. I’ve updated the Pinterest page for you. “Why don’t more people know about this place?” It’s rare that you will find a liberal arts college that has a waterfront campus where you can learn to sail. 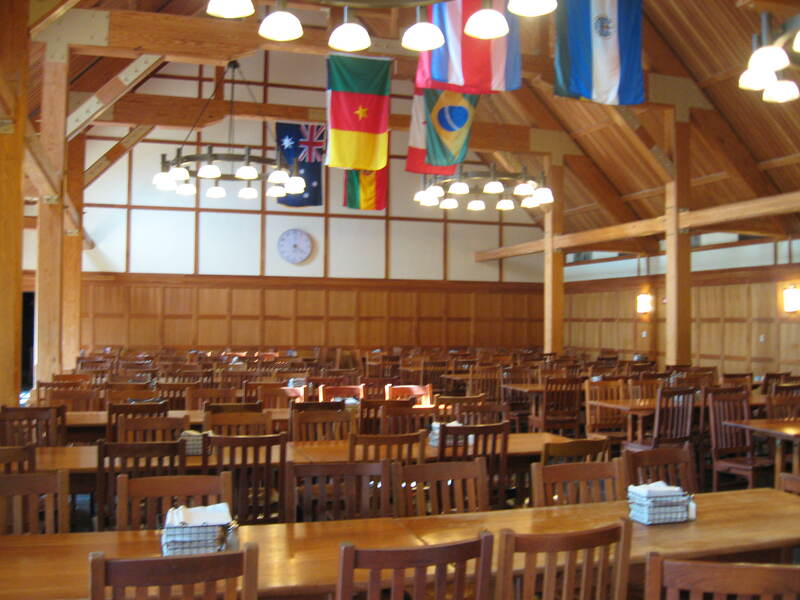 The dining hall looks like it could be in a ski lodge. There is no Greek social life at this school, but that’s a strength for some students who are considering a small college, and prefer one with fewer obvious cliques. “This campus is nice, but nowhere near anything.” There are strip shopping centers and a movie theatre not far away on MD-235, if you have a car. Annapolis is over 90 minutes from campus, and it will take two hours to get to Washington DC. The drive to campus is not that difficult, but it’s a bit far off I-67, the major interstate between Richmond and Washington DC. “Parts of this college are like a museum.” How many college campuses were designed to look like a 17th century settlement around their main academic center—and have had archeological digs on campus to find artifacts from that era? The college also has a Museum Studies minor, something that you won’t see at most colleges of any size. At the time that I visited St. Mary’s I liked the college’s approaches to Anthropology, Applied Physics, Environmental Studies, Political Science and Public Policy. From reading about these majors on the college’s Web site, I still do. Less than six months after I visited, St. Mary’s gained some interesting notoriety for using a former cruise ship as temporary student housing after mold was discovered in a residence hall. Since then I’ve tried to follow the college in the media as often as I could. The concept of a true public liberal arts college is interesting, especially when its student body size so closely resembles private liberal arts colleges. However, some of the numbers that people use to consider a school have become less impressive for St. Mary’s. This spring St. Mary’s had fewer than 1,500 degree seeking undergraduates, down over 200 from 2013. In the fall of 2012, St. Mary’s welcomed 419 freshmen; this past fall there were 340. Prior to 2012, there were approximately 450 students in a freshman class. At the same time that the size of the entering classes got smaller, the freshmen retention and graduation rates declined. Ninety percent of the class that entered in 2012 returned for their sophomore year, excellent for a liberal arts college, public or private. Two years later, retention dropped to 86 percent. Seventy-two percent of the class that entered in 2012 graduated in four years. Two years later, 68 percent of a smaller class received their degrees on time. The numbers for the class that arrived in 2014 are not necessarily bad for a school that had reasonably achievable admissions. The average high school GPA for students who arrived in both years was between 3.3 and 3.4, and they didn’t need high SAT scores to get in. But when a college attracts a smaller class that has no better than the same statistical profile, and has more difficulty retaining them, it is fair to be concerned about its future. It is also fair to be concerned about the concept of a public liberal arts college, especially one that closely resembles a private school. I’m quite sure than Maryland, like any other state, has its share of cynical politicians who would like to see St. Mary’s move, or be moved, in another direction. The St. Mary’s educational experience was, and still is, more expensive than the charges assessed by larger public colleges in Maryland for in-state students, though it will be less expensive than private college options such as Goucher College or Washington College for residents and non residents. St. Mary’s also costs less than the University of Maryland-College Park for non residents who cannot qualify for need-based or merit-based aid. But while schools such as the University of Maryland-College Park, Towson University and Salisbury University may attract as much as 30 percent of their freshman classes from other states, St. Mary’s draws in less than ten percent. It’s understandable that the leadership of a state-supported liberal arts college would like to see most of the students come from in state. That would be fine, if Maryland’s high school demographics worked in their favor. However, that number has actually declined by four percent from five years ago. Maryland’s high school graduation numbers are expected to rebound, making up most of the loss of 2,500 students by 2023. But college administrators cannot afford to wait that long, especially if they lead a state-supported school. I have visited other small liberal arts colleges in locations that are as least as isolated from larger cities as St. Mary’s. I have visited only one, Gettysburg, that has done a better job at connecting itself to America’s history and politics, and St. Mary’s costs a lot less. It does not have as many majors and minors as Gettysburg, but it does not need to add much beyond a business curriculum to complement the liberal arts and help its students to become more skilled and marketable as interns and employees. 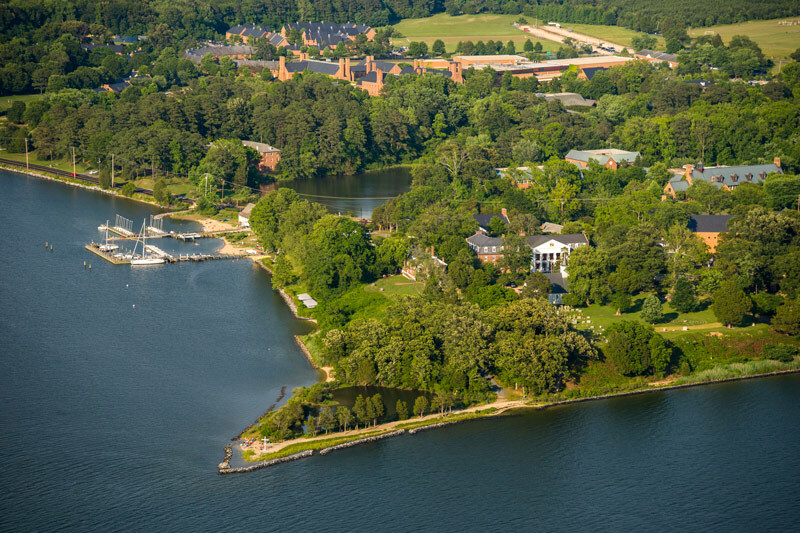 St. Mary’s is probably more similar to Washington College on Maryland’s Eastern Shore in terms of academics, historical connections, location and student body size. But there are two critical differences: an undergraduate business program, and fairly generous scholarships that make the school price competitive vs. St. Mary’s for similar students from outside Maryland. I realize that investments in academics, marketing and student achievement are expensive, especially for a school that is required to maintain accountability to a state system administration, a governor and a legislature. But this school must attract more students, especially outside of Maryland. St. Mary’s could be considered a “hidden treasure” for advocates of the liberal arts college. But it cannot afford to be hidden for too long. Check out my St. Mary’s College of Maryland Pinterest page! Need help on the journey to college? Contact me at stuart@educatedquest.com, or call me at 609-406-0062.